Notes: Author(s): Washington Medical College, Baltimore. Notes: In 1825-1826 a group of physicians led by Dr. Horation Gates Jameson, a prominent Baltimore surgeon, applied to the Maryland state legislature for a charter to found a medical college. 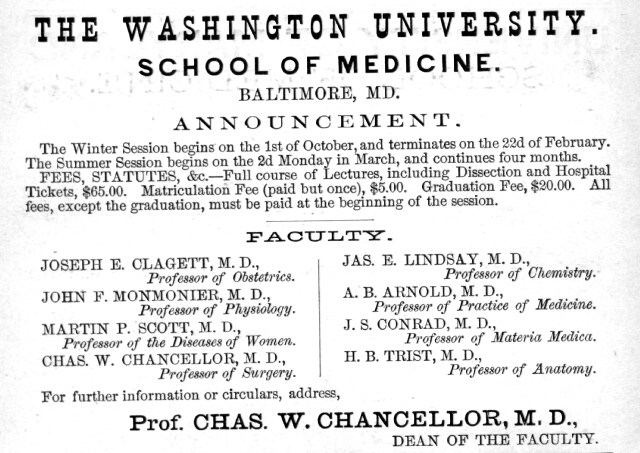 When this request was denied because of pressure on the legislature from the already-existing University of Maryland Medical School in Baltimore, Jameson contacted Washington College in Washington, Pa., a small liberal arts college which had been founded in 1806, and secured the authorization to establish a medical school in Baltimore under its charter. 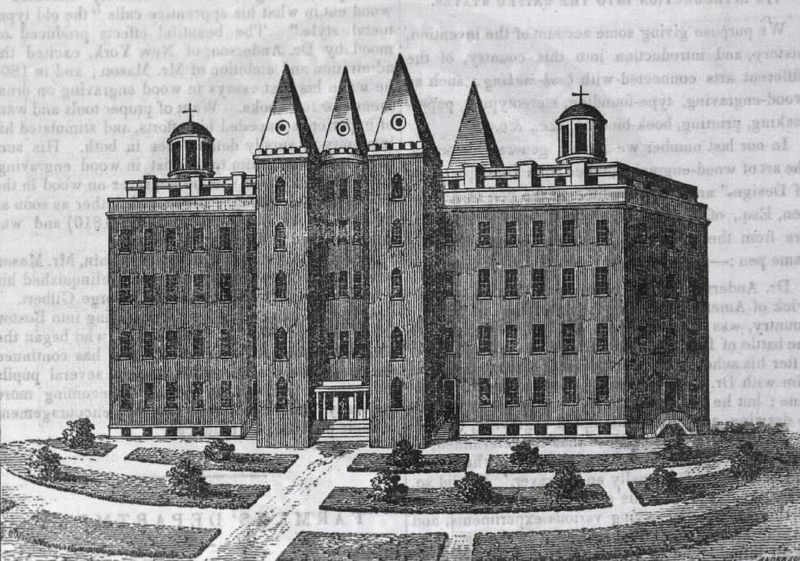 Notes: The new medical school first opened its doors in 1827 in its especially constructed facilities on Holliday Street, the facilities of which, as described by a contemporary source, were “less complete than the University.” To obtain the M.D. degree the students were required to attend two sessions of instruction, — although 12 were graduated at the end of the first year of the college with the explanation that they had attended other institutions previously — to pass an examination on all subjects taught by the faculty, and to present an acceptable thesis. The session began on the last Monday of October and continued for four months. Fees were as follows: Tickets $15, diploma $10, matriculation fee $5. The original faculty was composed of six members. Citizens generally are respectfully invited to attend. Notes: Washington Medical College.—The buildings lately erected by this institution, are said to be on the most elevated grounds within the limits of the city; they are constructed in a novel and magnificent style of architecture”. The length is 195 feet. The centre building is circular, 40 feet in diameter, and four stories in height. At equi distant points connected with the main building are four quadrangular turrets six stories high, with obelisk roofs. There are two wings each 60 by 40 feet. On the whole, the College presents a most imposing appearance. 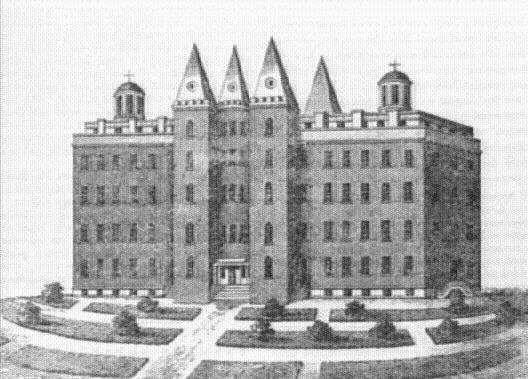 Notes: Iin 1839, the year after the college occupied this new building, it was so prosperous and the chances for its future appeared so bright that it obtained another charter giving it title of the Washington University of Baltimore with permission to add faculties of Law, Divinity, Arts and Sciences, and the necessary preparatory schools. But no other faculties were ever created and ten years later the “University” undertook a venture which lead to its extinction.For some reason or other, the faculty decided that their present location was too far from the city and that this was not to the best interest of the school. Therefore they undertook to erect a new building in the center of the city which was later known as the “New Assembly Rooms,” a popular place for meetings and concerts. Each professor of the school donated $1,000 to cover the cost of the new building. Lectures were held there from 1849 to 1851 when the whole venture collapsed for lack of funds. So great was the debt that the hospital building on Broadway was also sold, and the school was forced to close its doors after having graduated a total of 183 students. Notes: Washington University of Baltimore — The introductory lectures in this institution will commence on Monday evening next, at the new hall in Lombard street which it is thought will be entirely ready by that time. This institution has gained many warm friends, and promises to share more largely this winter, than usual, in the number of students which annually visit our city for purposes of medical instruction. Notes: Washington University Medical School removed from Broadway to New Assembly Rooms, northeast corner Lombard and Hanover Streets (September 17). Notes: The Faculty of Washington Medical University removed from Broadway to the northeast corner of Lombard and Hanover streets (New Assembly Rooms). Notes: Building of Washington Univeristy on Broadway and Lombard Street sold for debt and the institution closed. Notes: The Washington Medical University buildings, on Broadway, and their new hall, on Lombard street, sold for debt and the school closed. 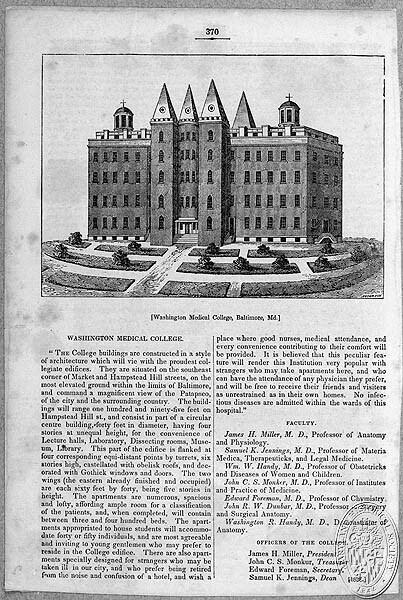 Notes: The second period of the Washington University Medical College began in 1867 when a group of Confederate physicians united to forma medical school with the expressed purpose to “arrest the tide that tended Northward, and offer to the young men of the South congenial homes.” The chief instigator was Edward Warren, who had distinguished himself as Surgeon-General of North Carolina during the Civil War and who had returned to Baltimore to resume his chair as Professor of Materia Medica and Therapeutics at the University of Maryland. Conditions had necessitated that his chair be filled before his return, so when he did not succeed in regaining his old position, he joined with a number of physicians, most of whom were newcomers to Baltimore, to found an new school…. Notes: The school opened in an old converted warehouse on Calvert Street and during its first year succeeded in having the Maryland legislature pass an act authorizing the erection of the Maryland Free Hospital in connection with the college. This was built acroos the street and when finished and occupied in 1871 included both the lecture rooms, dissecting rooms and hospital. The cost and upkeeping of the hospital was provided by grants from the State of Maryland in return for which the college had to treat indigent patients free of charge and to grant scholarships to one student from each senatorial district…. Notes: Washington Medical University reorganized. Faculty, Dr. Thos. E. Bond, Sr., President and Profess of Materia Medica; Edward Warren, of Surgery; H. L. Byrd, of Obstetrics; Jas. P. Logan, of Practice; J. W. Walls, of Anatomy; Pascal A. Quinan, of Physiology; H. St. Geo. Hopkins, Diseases of Women and Children; Jas. 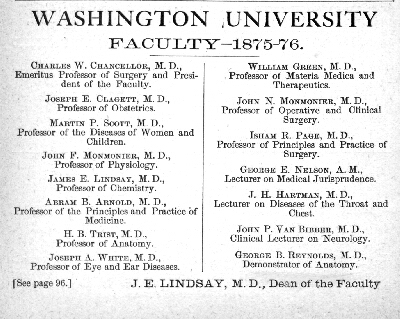 E. Claggett, Medical Chemistry and Pharmacy; J. n. Monmonier, Demonstrator of Anatomy, and A. H. Powell, Adjunct Surgery; C. M. Mofitt, Adjunct Practice; T. H. Wingfield, Adjunct Physiology. Lectures of Washington Medical University are held at northwest corner Calvert and Saratoga, and in 1871 at northwest corner of same streets (now City Hospital and College of Physicians and Surgeons).